Free of toxic phthalates, dioxins and furans, phenal, or heavy metals. SGS tested and verified. This DuraFit Extra Thick Eco-Friendly Premium Yoga Mat with Free carrying sling is a full 1/4” thick (6.2mm), an extra long 72”, and is one of the thickest mats you’ll ever find. This Eco Friendly yoga mat is made of PER (Polymer Environmental Resin), which is a unique material that is more sensitive to the environment and your health than yoga mats made of standard PVC. This SGS tested mat does not contain toxic phthalates, dioxins and furans, phenal, or heavy metals and has an ecologically safer method of production. 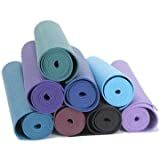 But, most of all, this mat performs great for all types of yoga exercises with excellent traction and cushion. The mats come in a variety of colors. This well-made Eco-Friendly exercise mat will make your yoga workouts more comfortable. Due to its high quality, this deluxe mat will last longer than most standard mats. A thicker non-slip mat is recommended for all types of yoga, especially for restorative poses.